Where can you get the sustaining energy to homeschool your children day after day? How can you find the patience and perseverance to do this homeschooling thing well? It’s all about how we start our mornings. My husband gets up a bit earlier than I do. And each morning he brings me a cup of coffee 💛 I’ve often told him, “You don’t need to do that!” but he insists that he wants to. 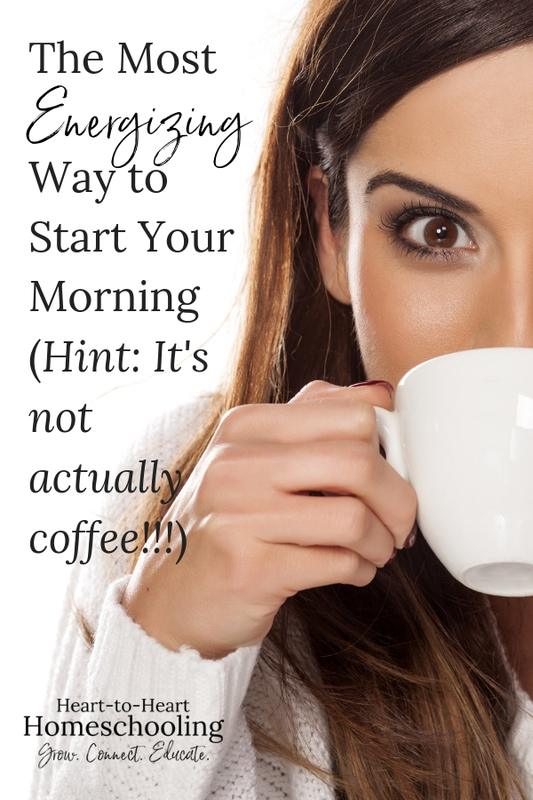 Do you like starting the day with coffee? It’s like a signal to my brain to wake up and get going. But as much as I enjoy slowly sipping a cup of good coffee, it will never give me the sustaining energy I need for the rest of the day. In case of an emergency, oxygen masks will drop down in front of you. If you are traveling with a child, please put on your mask first before assisting the child seated next to you. As mamas, our instinct tells us to take care of our babies first. But how can we do that if we have passed out? We get the logic when it comes to airline travel. But we believe when our feet are on the ground, we can ignore that advice. Instead—start you day by putting on your oxygen mask. Was there ever a person who gave more than Jesus? And I’m not even referring to giving His life on the cross for us, but His day-to-day sacrifices. Jesus taught, cast out demons, and healed the sick. He was a champion of the poor, widows, orphans, and women. He offered life to sinners. He ate with tax collectors and hung out with fisherman. He took time for little children. The religious leaders questioned Him constantly, and plotted against Him. Those in his hometown, and even His own family rejected Him. Yet Jesus kept serving. How? The story of Jesus’s feeding of the 5000 gives us a clue about at least one reason. When we hear the story, we often focus on the miracle itself. But I want you to look closely at what Jesus did at the beginning and the end of the story. What did Jesus make time to do? Jesus had just received some devastating news: His cousin John the Baptist, the one who prepared the way for Him, had been beheaded by a foolish king. Oh, the grief Jesus must have felt. What did He choose to do when He heard the news? In the midst of His own grief, he compassionately ministered to the crowds. And after this long day he performed an incredible miracle, feeding over 5000 people with just five loaves of bread and two fish. And there were even left-overs! Y’all, I don’t even have left overs when a few teen boys come over. Now notice what He did next. Jesus Himself sought time alone to pray. Despite the earlier interruption, He made time following what must have seemed an endless day. This wasn’t an isolated event, either. We find these moments scattered throughout the gospels. Let that sink in a bit. As busy as Jesus was, as exhausting His ministry must have been, and with as many people who needed Him, he took time alone to pray. If Jesus needed this, how much more must we? Sweet Mom, you are ministering to your family daily. So many responsibilities clamor for your time and attention: clean the house, cook the meals, do the laundry, play with your children, referee their arguments, teach them their letters and math and even math with letters (oh, sweet algebra!). I know it is exhausting. Overwhelming at times. Maybe the thought of taking time alone to pray, or to do anything, seems impossible. You may be trying to figure out how to just go to the bathroom by yourself. But here is the truth: If you don’t fill yourself up with life-giving oxygen, there will be consequences. When someone experiences oxygen deprivation, they show these symptoms like restlessness, anxiety, confusion, rapid and shallow breathing, and a racing heart. And when we are extremely tired, stressed, and overwhelmed we can have these same physical reactions. Please, don’t wait for it to get to that point. Don’t wait for the burnout, the feelings of depression, or the loss of joy. You simply cannot give from an empty cup. And prayer is one of the primary ways to fill it up. You might not be able to do that. I’m pretty sure Luther never had to get up multiple times during the night to feed a baby (not that he wasn’t busy in some other important ways!). But you can do something. Write out Scripture on index cards and tape them to the mirror where you get ready in the mornings. You can use the Scripture as something to meditate on as you get ready, and to repeat back as a prayer to God. Have a journal by your bedside to write a morning prayer in. It doesn’t have to be long or elaborate. You can even start with simply writing 5 things your are grateful for each morning. Or choose a different topic for each morning of the week. For example you could say a prayer of gratitude on Monday, a prayer for your family on Tuesday, a prayer for the government and our leaders on Wednesday, etc. Write out a prayer the night before and read it aloud the next morning to start your day. Begin your homeschool day by praying with your children. I know that sounds obvious, but it’s easy to overlook. You can even start a prayer notebook with them that includes prayer requests, answered prayers, and their own prayers that they journal. You can connect to God through prayer. You may have to get a bit creative. You may have to give up something. You may even have to ask for help. But please, follow Jesus’s example. If he made time to get alone and pray, then certainly we can figure out a way to do the same. Do you need a guide to help you dig into the Word each day and pray? Download the FREE study, Who I Am in Christ and join the Heart-to-Heart Homeschooling community of women who want to deeply connect with God and their children. Thanks for your reminder Kay! I’m currently going through a period of feeling overwhelmed and it’s so helpful to remember to be more like Mary rather than Martha and soak up the teachings of Jesus at His feet! You are so welcome! It is a truth I have to remind myself of often, too! Thanks Greg! I know my husband’s support over the years was so crucial 🙂 I’m so glad to hear that you realize the importance of her care too. I’ve learned (and continue to learn) through experience how much harder I make things when I try to power through them in my own strength. Thanks for taking the time to read and for your sweet comment. Be a Heart-to-Heart Homeschool Mom! Customize Your Homeschool Experience - Get the 29 Page Workbook Today! Success! Now check your email to confirm your subscription and receive your free download.